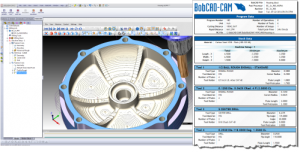 Clearwater, Florida – BobCAD-CAM announces the release of their new Gold Partner CAM product; BobCAM for SOLIDWORKS™ V4 which marks yet another milestone in the history of the BobCAD-CAM software family. 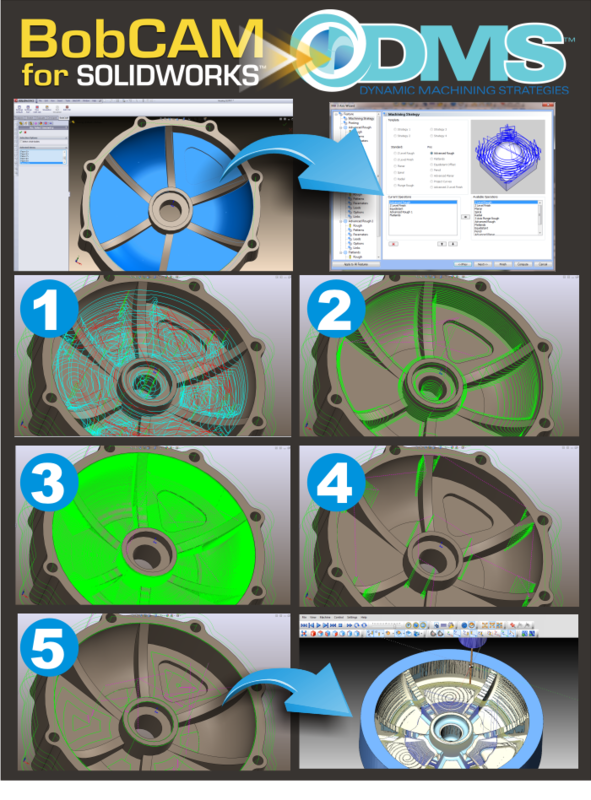 BobCAD-CAM has rebuilt the CAM portion of the software to bring BobCAM customers the most advanced and versatile machining package ever available from BobCAD-CAM. 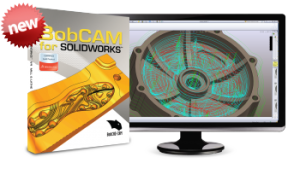 As a Gold Partner CAM solution, the BobCAM Add-On product provides a powerful modular approach to CNC part programming. This means that there is a machining solution for all shops, at all levels starting with 2.5 Axis and moving upward to advanced 5 Axis CNC machining technology, right inside of the SOLIDWORKS environment. With each of these areas being addressed, the new BobCAM V4 is ready for SOLIDWORKS users to raise the bar in programming and achieve success faster and easier than before in CNC programming. 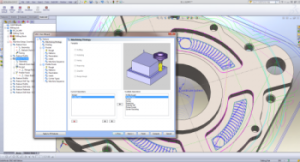 BobCAM for SolidWorks V4 introduces Dynamic Machining Strategies™. DMS™ functionality provides full control of the operations that are applied to a single machining feature. You can assign any combination of the available operations based on the type of geometry that you are machining. This is just one of the many improvements added to BobCAM for SolidWorks V4 that directly affects programming speed and software ease of use. In earlier releases, machining operations had to be loaded into the CAM tree individually, involving the repetitive selection of geometry in cases where more than one machining strategy was needed to finish a part. DMS functionality allows the user to select all of the geometry “features” and then load as many machining operations as necessary in one location to automatically populate the machining wizard for proper programming. This new functionality results in a huge reduction in time. The following general CAM enhancements are not focused on any specific machining feature or operation. These newly developed enhancements are more generalized to increase simplicity in programming and eliminate wasted time. CAM Jobs Result in a Custom CAM Tree: The longtime request of the CAM Tree only containing the information for the current job has been answered. When you start a new file, the CAM Tree actually contains only one folder that is used for system settings and job creation, the CAM Defaults. The only other items that are added to the CAM Tree are added by you when you create a CAM Job. This keeps the CAM Tree clean and easy to work with for your jobs. Faster Job Setup with The Machining Job Dialog Box: When you are ready to start a job, you open the Machining Job dialog box to select the Job type and a machine for the job. You can then immediately start the Mill Stock Wizard or Lathe Stock Wizard directly from the dialog box to get started defining the program. Thus, consolidating important setup functions to streamline productivity workflow. Support for Multiple Jobs: Although only one job is needed, one or more jobs of any type can be added to a single file. This means that Milling Jobs and Turning Jobs can both be added to the CAM Tree in any combination. This supports the programming of a job all the way through from start to finish in cases where multiple machines are requires to finish a job. The following aspects of the CAM Tree are improved to make job creation easier, faster, and more consistent across all CAM modules. Copy & Paste Features & Operations: You can now use copy and paste to quickly handle redundant work or similar tasks when creating features and operations. This is provided in addition to the existing Feature Save and Load options as a faster solution to saving and reloading features repetitively. The copy and paste commands even work across multiple open documents! Improved Shortcut Menus: The shortcut menus are more logically ordered and minimized to aid in speed and navigation. The CAM features can now be edited and computed from the top level of the feature. No more expanding numerous tree items just to get to the feature edit icon. Even the shortcut menus for the operations of the feature can be accessed faster with the new design. Expand & Collapse Tree Items: Expand and Collapse functions are added to the CAM Tree for more easily viewing or minimizing all items of the Job, Machine Setup, Index System, or Wrapping Group. BobCAM takes into consideration Geometry Based Machining. For both Mill and Lathe, BobCAM has moved to a CAM system that is based on CAD features (or geometry). Now a feature, by definition, is part of the CAD model and pertains to the geometry. When you select a feature of the model, you can choose any combination of the available operations to machine that one feature. Previously in the CAM Wizards, the machining strategies contained a fixed number and type of operations that were available. With the new dynamic operations, the CAM Wizards can contain any number and order of operations that can be applied to a single CAD feature or geometry selection. Dynamic Operations: Both Mill and Lathe now provide the flexibility of Dynamic Machining Strategies, which allow you to select any combination of machining operations based on the type of geometry that you are machining. The Hole Drilling features are greatly improved with the use of dynamic operations. Now if you want to drill a hole, but need to use a smaller drill to pre-drill, there is no need to edit the Tool Pattern, you can just add another drill operation. Dynamic operations benefit 2-axis machining as well. You can now add several finish passes by just adding more operations to the feature. The operations don’t share parameters as they did in the past, so you gain complete control of the 2-Axis operations. Rough and finish operations can start in different locations, without using multiple CAM features, thanks to the addition of chain start points at the operation level. There is also a default chain start point that can be used to set the start for all operations in the 2-Axis feature that also contain a start point. The dynamic operations also create a major advantage for 3-axis machining. Now instead of having to create multiple CAM features and select the same model over and over again, you can simply create one feature, select the model, and apply any or all of the 3-axis operations to that model. You can even define a boundary for each operation that overrides the boundary that is assigned at the feature level. The CAM Wizards now contain an Apply to All Operations button to help speed up the process of defining the same parameters for similar operations. For example, when defining the leads for a feature that contains multiple operations, you can set the lead-in and lead-out once, click Apply to All Operations, and allow the system to automatically set the leads of the remaining operations. This same process is also used for certain feature parameters. For example, when selecting multiple hole sizes in the Hole Wizard, a separate feature is added to the tree for each size. You can then define the Machining Strategy once, click Apply to All Features, and allow the system to automatically set all of the drilling features to the same strategy. The Machining Order dialog box controls the posting order of operations for the program. In BobCAM for SolidWorks V4, you now have full control of the posting order including the previously existing optimization types: Individual Tool, Individual Feature, and Individual Tool Per Machine Setup. You can set the optimization type to reorder the operations, and you can also select and move individual operations up or down in the list to give you total control with the dynamic posting order. Milling and Turning Jobs both provide the ability to create Setup Sheets from the current job information. Programmers can create the setup sheet for the operator to get all the pertinent information for an upcoming job setup. This includes information such as the program data, stock data, material data, tool lists, and operation data that is output locally by opening a browser window with an .html report. The Setup Sheets were designed so that they can be customized utilizing an .xsl and .css file that control the output information and format. Templates are provided with the system that include full reports or tool-only lists to get you started creating Setup Sheets. Simplicity of the system is greatly improved by the fact that many of the informational databases are now either shared or identical between Mill and Lathe. The functionality of the Tool Library, Thread Library, Tool Pattern, Tool Crib, Stock Wizards, Material Library, Cutting Conditions, Current Settings, Machining Order, and Setup Sheets are all available to both Milling and Turning Jobs. The Tool Pattern handles all the operation templates for the Machining Strategy in the CAM Wizards, which gives you control of the default operations used for all Mill and Lathe features. The benefit is being able to define commonly used strategies to save time when selecting the operations to use for a feature. The operations that are defined by each template can also be modified in the wizards at any time during feature creation. You can import tool patters. The Tool Pattern file can be imported directly from the dialog box so that you can update BobCAM for SolidWorks V4 with any tool pattern information that you have from an earlier version. •	The simulation now retains your previous settings so there is no longer a need to make the same changes each time you launch the simulation. •	Collision and Proximity Alert (available in the Toolpath Analysis tab) checks for collisions between tool, stock, and machine and colors the toolpath display, as the tool cuts, to signify if that part of the toolpath is alert free, in collision, in proximity area, or not yet checked. •	An Extended Warning System window was added to the Report tab to provide further information about collision checking. •	Single Marking option was added to the Stock Analysis and Toolpath Analysis tabs to allow for all cut material or all operations to display in a single color. •	Tool Flute color change option was added to the Stock Analysis tab to display the tool flute using the same color as the current stock analysis settings. •	Fast Collision Checking algorithm speed improved when checking any geometry, such as the machine, and the actual stock material. •	Gouge Report options were updated and renamed to Gouge and Excess, which include excess material display as well as gouges (additional parameters are accessed from Advanced Properties in the “Cutsim” tab). •	New color scheme for Deviation Analysis uses only three colors to display rest material: blue (excess), green (within tolerance), and red (gouge) (Gouge and Excess must be selected for Color Range). •	Option added to import an image to use as the background color in simulation window. Lathe Wizards: The Lathe module received a total overhaul with the addition of the Lathe CAM Wizards which completely match the workflow of the Mill CAM Wizards. The Lathe CAM Wizard starts with geometry selection and leads you through setting up the feature parameters, machining strategy, and operation parameters of all Lathe features. Improved Lathe Feature Creation: The new Lathe CAM Wizards provide a much more consistent and logical layout of the parameters for Lathe features. Once again the old dialog boxes were redesigned to more logically group the parameters as you work through the wizard. 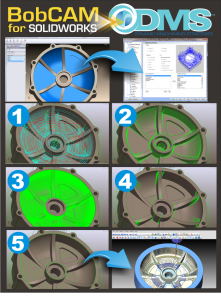 New images help to illustrate the parameters that you are editing, and the much-loved wizard workflow greatly improves Lathe feature creation, especially for anyone familiar with the Mill CAM Wizards. Lathe Stock Wizard: A Lathe Stock Wizard was added to make the Turning Job setup process the same as the Milling Job setup process. You can create standard Cylindrical stock by typing the values into the dialog box, or you can also create custom stock geometry using the Revolve option to revolve a closed 2D chain. The Lathe Stock Wizard then leads you into the Machine Setup to define the clearance plane values for the job. When you finish, you are ready to start creating Lathe machining features. Lathe Drilling Matches Mill: All of the power of the new hole drilling functionality for Mill is also available for Lathe. This includes the center drill, drill, tap, ream, and bore cycles for both Milling and Turning Jobs. The drilling canned cycles and the use of the Cutting Conditions to set the default values for each drilling strategy are consistent through Mill and Lathe. Drill tools are now shared between the two with the addition of the unified Tool Library that handles all Mill, Drill, and Lathe tools in a single location. There is no longer a need to have the same drill tools defined separately for Lathe and Mill. 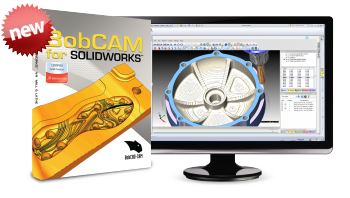 BobCAM for SolidWorks V4 helps to elevate BobCAD-CAM’s ever-increasing reputation as an extremely powerful and affordable CAD-CAM software solution. The changes made to BobCAM for SolidWorks V4 provide a solid foundation upon which many great future advancements will be built. BobCAD-CAM has released its newest Gold Partner BobCAM for SOLIDWORKS™ V4 series for 2.5, 3, 4 & 5 Axis CNC machine programming. New features include Dynamic machining Strategies and much more. Learn more here.